Now onto this delicious recipe! I wanted to make something besides a red, white and blue dessert for the final roundup. When I saw this beauty I knew I had to make it. 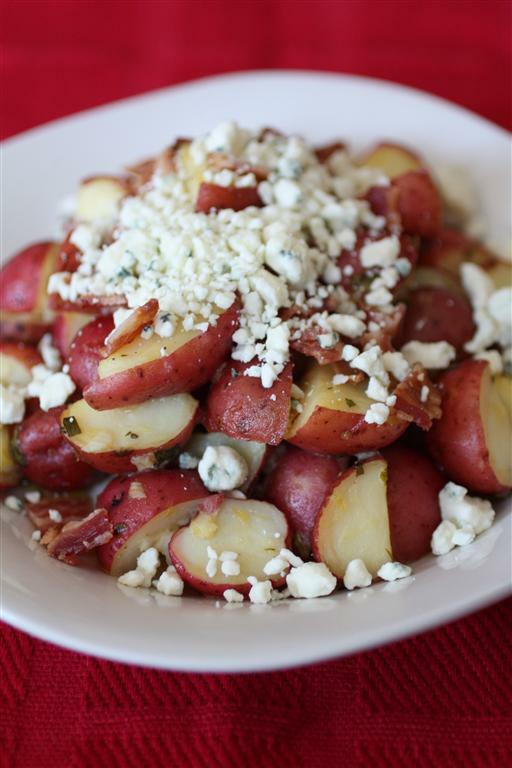 Potatoes, bacon and blue cheese…sounds like a winner to me! 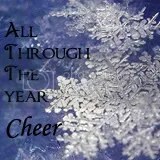 Although I do have one confession. I do not like blue cheese so I was a bit skeptical. I knew everyone else would love it, but would I? I bought a very a mild blue cheese and I found the taste to be very pleasant. If you are a die hard blue cheese fan I would say go for something stronger. The salad can definitely handle it. The best part about this recipe is all the contrast of flavors. You get the slightly tart flavor from the vinegar dressing, the soft potatoes, the crunchy salty bacon and the crumbly tangy flavor of the blue cheese. It also has no mayonnaise so it’s perfect for the summer time BBQ and picnic 🙂 Enjoy! Whisk oil, vinegar, shallots, parsley, 1 tablespoon chives, mustard, honey and lemon peel in large bowl until well blended. Season dressing to taste with salt and pepper. Cook bacon in large skillet over medium heat until crisp. Drain on paper towels. Crumble into small pieces. Mound potato salad on a platter. Sprinkle with bacon, blue cheese, egg and remaining 1/4 cup chives. This sounds delicious. I am a big blue cheese fan and potato salad fan. I actually have a recipe that uses blue cheese dressing. I like yours way better with the homemade dressing and blue cheese:) Thanks! Lovely Salad recipe :-), Sorry, I am not American so no submissions for July 4, although it is my uncle’s birthday! 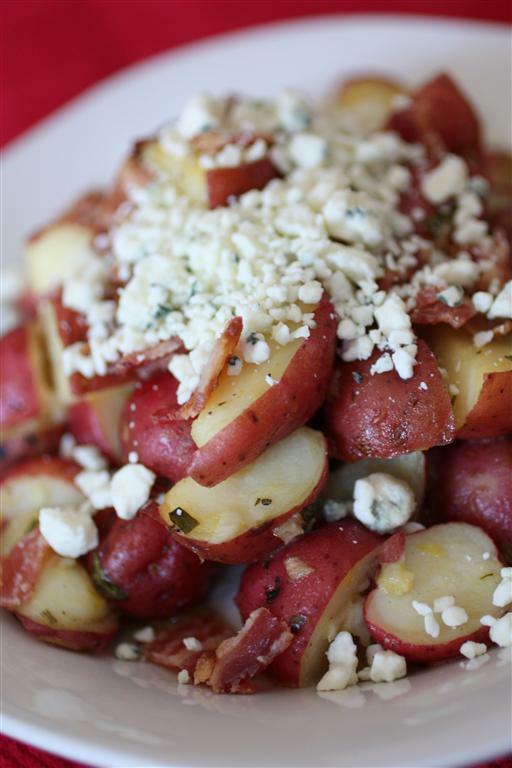 What a fun way to change up potato salad for the holiday. I love, love, love this salad! Blue cheese, bacon and potatoes? You can’t go wrong with that combo! So delicious! Looks great! Bacon, cheese, egg, potato = all my favorite things. I’m torn, because while this looks so so delicious the man and I aren’t blue cheese fans. But we both agreed substituting in feta cheese would be reason for a complete foodgasm. I am a blue cheese fan so I am sure that I will love this salad. It sounds and looks amazing! Happy 4th! Oops! I missed the deadline. Sorry about that.